Even before I touch on the contents of this ‘new and selected volume’, it is worth pausing for a moment to mention the book as aesthetic object. I have always enjoyed publications from Shoestring Press, but this is easily one of the handsomest books they have produced to my knowledge. 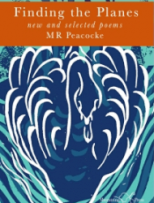 The pages are broader than usual, leaving plenty of breathing space for the poems and the cover image of a stylised rendering of a swan by Pip Hall is attractively apt. The swan is apt because these poems are elegant units that glide from mouth to ear or page to mind’s eye but, like a swan’s webbed feet underwater, there is much movement going on beneath the surface. my fish and golden lamb. to men with red whiskers. He is buried at the end of the alley. Leaves have filled his mouth. uncounted images of one countless man. say the bones. All angle and dangle. Wind, rain. Let’s do without this day. hard as a gall in my throat. wanting a god to be angry with. oak apples, twigs, dry leaves, a bird. Nothing but this, it said. In the closing lines to the final poem (‘Paddling at Lake Aziscohos’) in this book, the speaker offers us a serio-comic zeugma: Unexamined life / not worth living. / Unlived life not worth / (Flip!) examining. Peacocke’s life is patently worth the living and the examining and I am glad that this poem playfully acknowledges this. These are poems of tremendous value that always find their planes, in spite of it all.